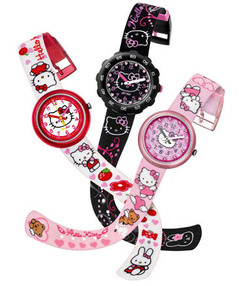 Hello Kitty fans will be clawing their way to one of these watches by Flik Flak. The new collection, by the children’s watch designer, comes in three different designs. The Hello Kitty & Pencil Pot is red and white with cupcakes and cherries on the strap. It also has a yellow second hand, for those of us who are a bit short sighted, and also comes with a bonus pencil holder and 2 pencils, making it perfect for die hard Hello Kitty fans. Hello Kitty Angel is decorated with teddy bears and clouds. It also has twelve sparkling pink crystals separating the five-minute intervals. They also pick up the colour of the dial’s heart-covered background. Those that want to be a little bit more subtle with their Hello Kitty accessories will love the Hello Kitty Cute Fashion watch, which is black with a jagged black bezel. Prices range from £27.95 to £33.95. Not a bad price if you need to buy more than one. hello kitty is the best.i am a big fan. i love hello kitty.i love you .from peace and Andrew kisskisskisskisskisskiss song hello kitty hello kitty hello kitty hello kitty la la la la la la hello kitty i love hello kitty hello kitty la la la la la la i love you hello kitty la la la yeh.i love you hello kitty.